Australian marketers support for digital advertising has continued to strengthen, new research has revealed. The latest IAB/PwC Online Advertising Expenditure Report has found that that overall digital advertising revenues have increased 11 per cent to $8.5 billion in Australia during the last financial year, with video growing 45 per cent and mobile growing 39 per cent. General display advertising showed the strongest growth, increasing 15.2 per cent in FY18, whilst growth for classifieds and search and directories slowed compared to prior year with 12.1 per cent and 7.2 per cent growth respectively. Growth in general display and classified advertising took share from search and directories, resulting in general display making up 37.1 per cent of total advertising, while classifieds made up 18.7 per cent and search 44.2 per cent. According to the report, the Australian market is maturing and diversifying, with marketers across a broader range of verticals now embracing digital video. 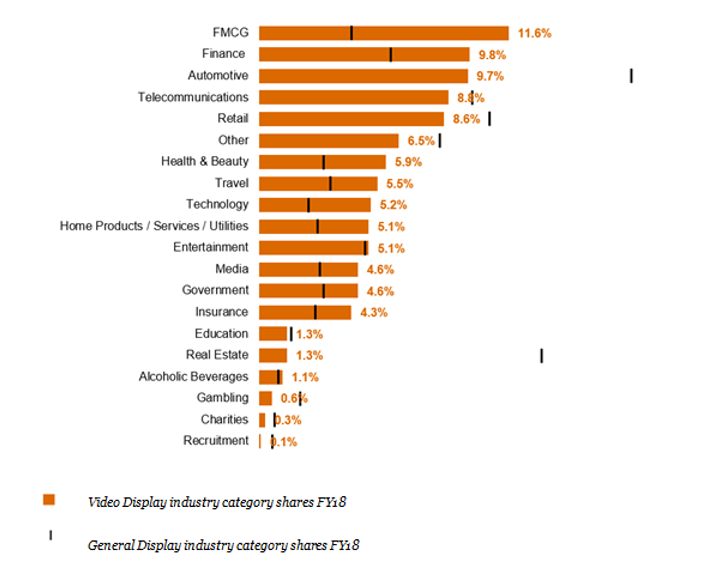 The top three categories for expenditure on digital video in 2017 represented 45 per cent of spend, whereas in 2018, the top three now represent just 31 per cent.